I’m always on the hunt for ways to use up things I have sitting around…and when I saw a stack of watercolor scraps and matched it up with some beautiful and simple dies – I knew I hit on a winner. Note that these could also look lovely using white paper instead of black – with the pop of watercolor showing through, it would be lovely like that! Watch the video below or click HERE to see it in HD on YouTube. And one more bonus card – also from the Light Parade stamp set….there are cute houses that I *gasp* cut apart and stamped down a hillside, then handcut the snowy hillside. Also painted with Hydrus watercolors. You know that there’s always goodies to be had on bloghops – and this one is no different! The winner may chose ANY Essentials by Ellen brand stamp set (Maximum value $25 USD) currently in stock at Ellen Hutson.com To enter my giveaway, please leave a comment on today’s post by Tuesday, October 25th! There is also a crazy good Grand Giveaway in the CLASSroom! To enter, be sure to leave a comment there, also by Tuesday, October 25th! ALL winners will be announced at the CLASSroom on Friday, November 4th! Please check there on that date to see if you are a winner and for further details on claiming your prize! 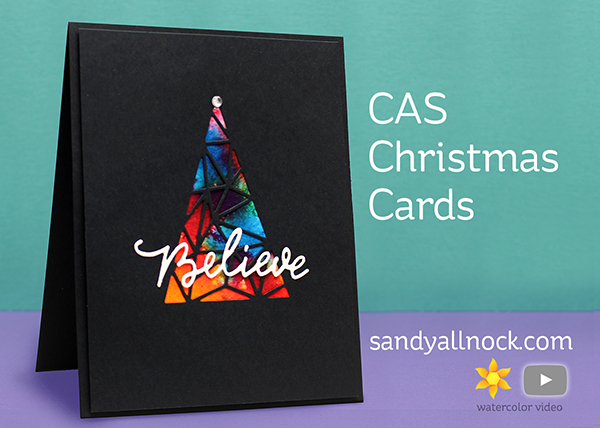 Let me know in a comment whether you focus on CAS or more complex cards for Christmas….and enter to win! If you get lost along the hop, please visit the CLASSroom blog for a complete list of all the designers. The previous stop on the hop was Lisa Adametz and the next one is the amazing Joni Nina Andaya! I love CAS cards. Keep them coming. You do such a wonderful job showing us step by step. I’m very new to watercolor, colored pencils and most recently the Zig clan color markers. So fast moving I have made bad turned out. You are such a talented artist. I wish I was an artist but I lack that talent. I will keep trying. Wow!!! The watercolor with the black cardstock is stunning!!! I’m just hoping to get any type of card done for Christmas. I LOVE your watercolor on black cards! They are stunning!!! The black background is perfect with the tree! I often find myself going clean and simple. These are all so beautiful! And as always, your coloring and talent just “woes” me. I love seeing your creations! Thanks for sharing!! 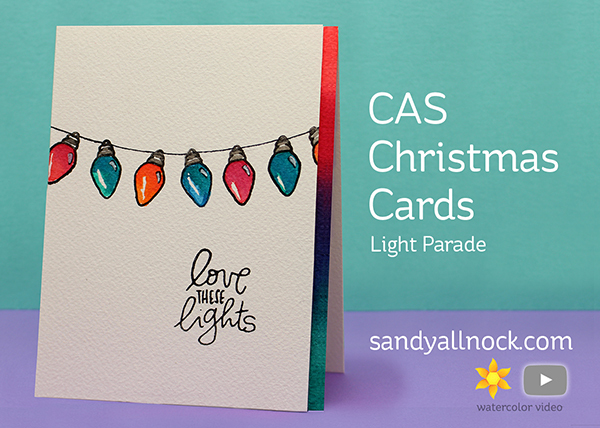 I focus on CAS cards for Christmas. Love those houses on the hill. Can’t believe you cut apart the stamp!! Stunning cards Sandy. Love the graphic look of the black cards.